What hues are most eye-catching in photos and videos? A recent Shutterstock study suggests a trio of three bold colors are seeing the most downloads. Released today, November 29, the Shutterstock 2019 Color Trends report highlights UFO Green, Plastic Pink, and Proton Purple as the most downloaded colors from the stock photo platform. Shutterstock suggests the bright colors are influenced by technology, as well as the emotions and cultures often associated with color. UFO Green — which photographers can find by typing in #7fff00 in Photoshop’s color picker — is among the top three colors in the world, while also sitting as the favorite for the U.S. Shutterstock says the color can both be natural — like a bright green countryside — and unnatural, like binary code. Plastic Pink is a hot pink color that’s popular in images of cities at night, the report says. Shutterstock suggests that all three colors are seeing a surge in popularity for their turbo-charged color. 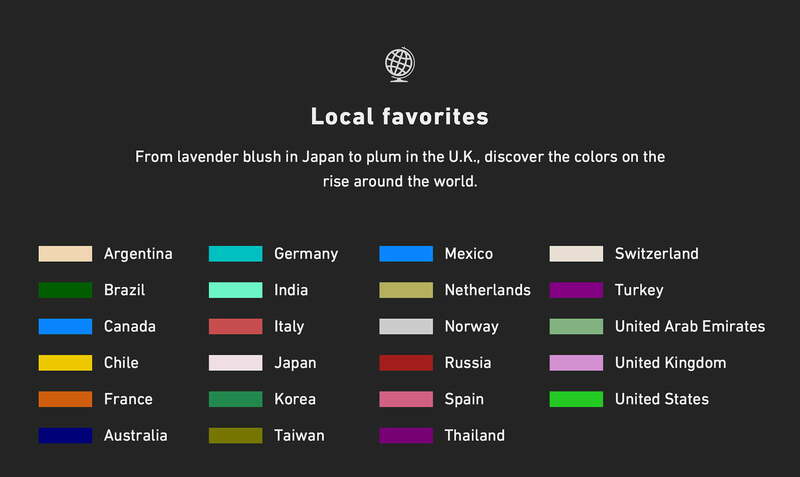 The report shows the three colors that are rising fastest in the download numbers, as well as highlighting the top colors from a number of different countries, including a lavender blush in Japan and plum in the U.K. The colors were determined by comparing the pixel data of the images with the number of downloads from Shutterstock. The 2019 Color Trends report is likely a precursor to additional trends reports common at the start of the New Year. Until the newest data comes out, photographers can glimpse back at Shutterstock’s 2018 Creative Trends report, which includes fantasy, new minimalism, space, natural luxury, punchy pastels, digital crafts, ancient geometrics, cryptocurrency, holographic foil, and more.